Pat Whelan is a member of a dwindling brotherhood, independent butchers. In the 21st century world of supermarkets, it’s getting increasingly hard to find these food artisans who thrived in a bygone era when people moved away from farms and no longer raised their own meat. His shop, James Whelan Butchers, in Clonmel, County Tipperary, Ireland, has been in business since 1960. The current shop, in a strip mall adjacent to a major supermarket, was opened in the 1970s, The location was appealing because it had ample parking. When asked why he became a butcher, Whelan answers, “It’s part of my DNA. It seemed natural for me to do. It’s was never a question of doing anything else.” What Whelan calls the “art of butchering” has been in his mother’s family for five generations. His dad is still involved in the business. He’s even more unique. 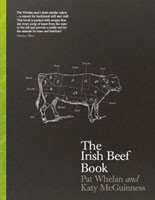 He raises his own Aberdeen Angus Beef and lamb and on the family’s 200 acre farm, Garrentemple Clonmel. The shop’s pork, ham and poultry come from local farmers (members of the Tipperary Food Producers, a group he helped found in2007). To maintain control over the integrity of the product, every animals is finished on the farm. “All animals have a residency period here,” Whelan says. “When you can walk through the entire process from raising to butchering there’s a great sense of satisfaction and fulfillment that money can never buy.” All the meat is slaughtered and processed in their on-site abattoir. Read more from Santa Fe Travelers blog.